The Chester County Library is offering a paddle-boat safety course in conjunction with the Coast Guard Auxiliary. Want to ensure you know what you’re doing the next time you decide to paddle down the Brandywine? The Chester County Library and District Center is offering an educational opportunity to help accomplish that. 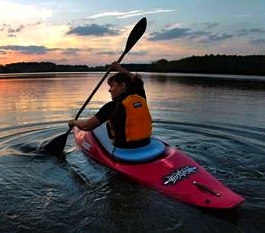 Partnering with the Coast Guard Auxiliary, the library is offering Paddlesports America, an introductory course designed to meet boater education needs for operating a paddle craft, specifically a canoe or kayak. Each student will receive a 47-page, four-color manual and certificate upon completion of the course. The program consists of two classes, which are being held on Thursday, May 9,, and Thursday, May 16, from 6:30 to 8:30 p.m. in the Burke Meeting Room of the Chester County Library in Exton. The test to become certified will be held Saturday, May 19,at 2 p.m. in the Burke Meeting Room. Patrons must attend both sessions and take the test in order to become certified. A $10 fee covers the cost of the manual. Visit www.ccls.org and click on “find an event” to register.